The morning shower or a visit to the pool: For orthosis wearers with partial or complete paralysis of the leg musculature, the daily routine in their own bathroom or taking part in water gymnastics is often associated with major difficulties. A bathroom with special equipment is not always available either when travelling or visiting friends and relatives. With the Aqualine orthosis system, Ottobock has launched the world's first waterproof walking aid designed specifically for use in wet areas. The Aqualine offers you the best possible safety and maximum freedom of movement. Its components are designed for contact with water and are lightweight, comfortable, easy to clean and dry quickly. ThermoLyn is antibacterial and has ideal hygienic properties. The loop strap is comfortable to wear and can be removed for drying. 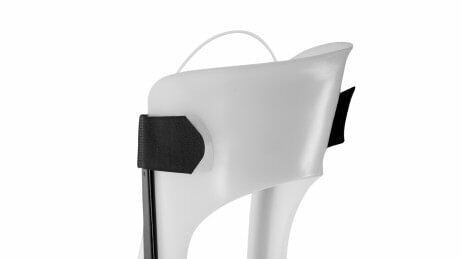 The knee joint is locked and can be easily unlocked using a pull-release cable when you sit down. The high-performance plastic material is reinforced with carbon fibres. It therefore fulfills the highest demands in terms of function, load capacity, durability and processing characteristics. The resistance and angle of the ankle joint can be individually fine-tuned to your requirements by your orthopaedic technician. Not only the joints but all components of the Aqualine orthosis system are waterproof. Chlorine, salt water, fresh water and soap do not impair the functionality nor the appearance of the orthosis. Ottobock has reinforced a high-performance plastic material proven numerous times with carbon fibres in order to achieve this. The bathing orthosis is very sturdy and yet lightweight thanks to this novel composite material, which was used here for the first time. You can move about safely in wet areas with the Aqualine. The Aqualine orthosis system is ideal for use in wet areas. You can simply remove the loop strap for drying after use. In order to prevent skin irritation, skin contact with the orthosis is minimised. 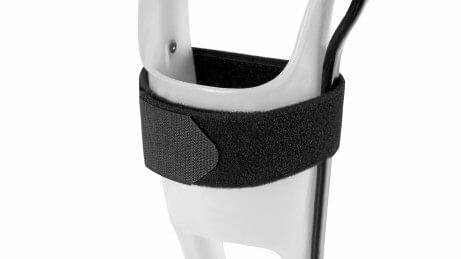 Using antibacterial materials for the fabrication of the orthosis by your orthopaedic technician is recommended. This improves the good hygienic characteristics of the Aqualine even further. 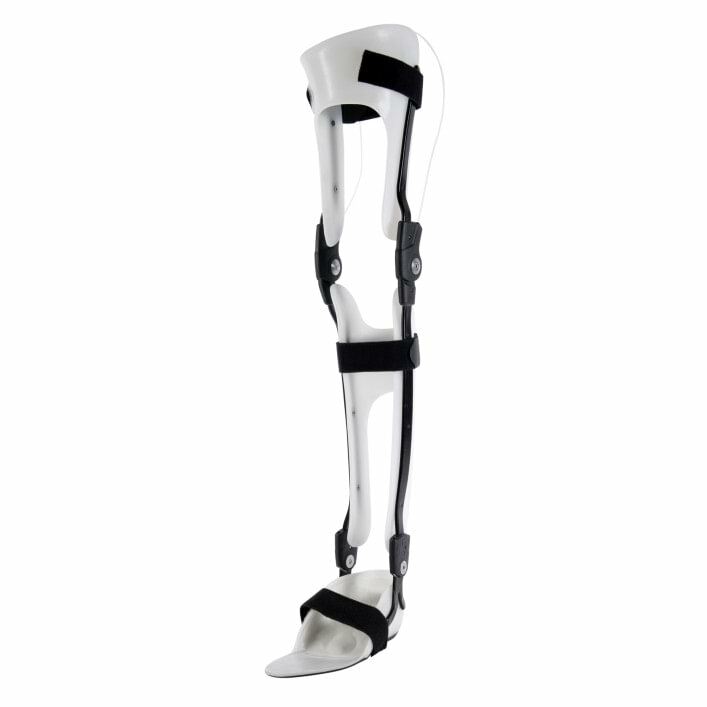 The modern locking system of the Aqualine knee joint provides you with the required safety. When you sit down, you can easily operate the lock with a pull-release cable to unlock it. The lock in the joint clicks into place automatically when standing up, without there being a risk of trapping clothes. Since the risk of slipping is especially high on wet floors, we recommend the use of a full-surface anti-slip sole. Of course you can also wear a bathing shoe as an alternative as well. The Federal Social Court in more than one decision has determined that ensuring mobility for people with disabilities in wet areas is a basic need and is therefore to be covered by health insurers. Orthoses for wet areas may therefore be equal to day-to-day orthoses in terms of quality, so that the health insurers have to provide the insured with the best possible functional fitting. This is your right! This information brochure provides general information about the Aqualine orthosis system as well as your legal right to a bathing orthosis. 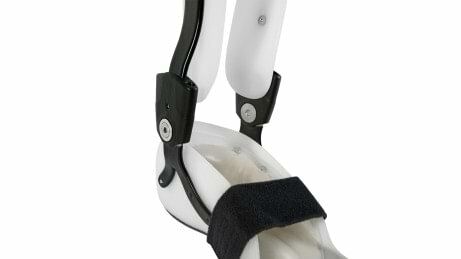 The Aqualine orthosis system is suitable for persons with partial paralysis or complete paralysis of one or both legs. 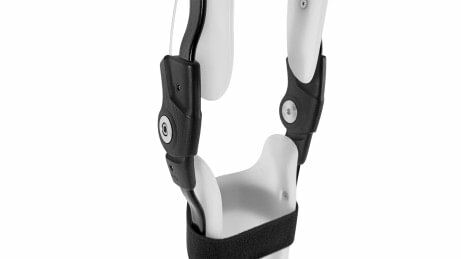 Your orthopaedic technician will be happy to advise you whether the Aqualine orthosis system is suitable for you. If you are interested in the Aqualine, contact your orthopaedic technician directly for detailed advice. Does insurance cover the cost of the Aqualine orthosis system? In several court decisions, prosthesis wearers were granted a fitting for wet areas in addition to their everyday prosthesis. These decisions can be applied to orthosis wearers as well, since the issue is fundamentally the same.